It’s Secret Recipe Club time again! This month, I was assigned to Fantastical Sharing of Recipes, a great blog by Sarah, who shares not only her own recipes, but also a good number of recipes from other blogs around the interwebs. Sarah’s got two cute kids and two adorable kitties, and shares lots of great family-friendly meals. Sarah’s blog has tons of great recipes! I especially loved looking through them all because she has lots of crock pot recipes, and my crock pot is my best friend lately. I had my eye on 40 Clove Garlic Chicken and Crockpot Spicy Chicken Chili, but in the end I decided to try Sarah’s Slow Cooker Tex-Mex Chicken. I followed Sarah’s recipe pretty closely, but instead of using pre-made taco seasoning, I made my own spice blend… it’s so easy! The chicken came out great. Super tender and flavorful. I served it over rice, but it would also be great wrapped up in some warm tortillas. 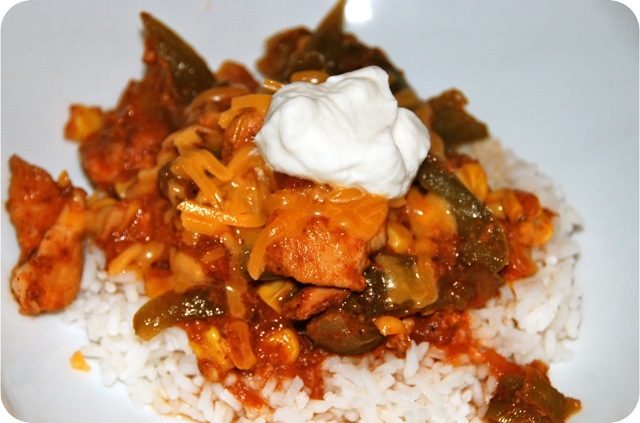 Toss chicken in seasonings and flour and dump into the crock pot. Add the peppers, corn and salsa and toss everything together. Cover and cook on low 6 to 8 hours, or on high 3 to 4 hours. Serve over rice, topped with cheese and sour cream. This is one of my all-time favorite recipes – so I’m glad you tried it 🙂 I need to make it again asap. This looks amazing! I just wish I had a slow cooker 🙁 Great SRC pick! 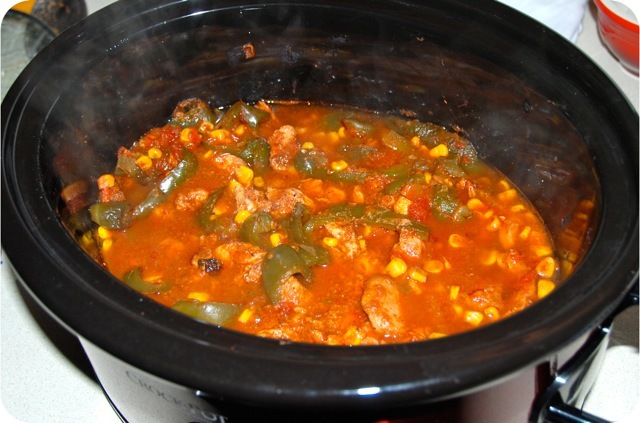 I am also a fan of good crock pot recipes–this looks like one. I like you spices–I try and stay away from packaged mixes. This is a great SRC pick. 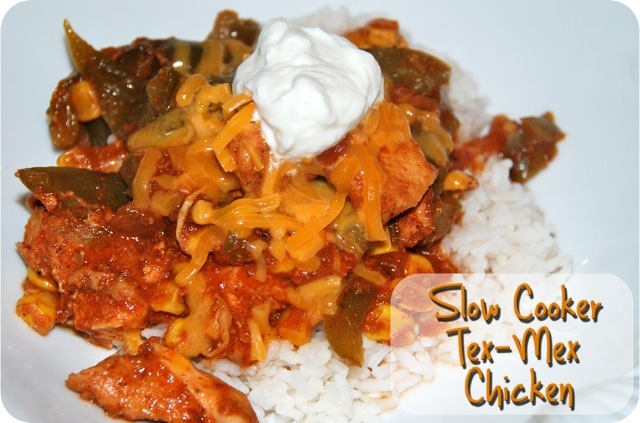 I love slow cooker recipes – so easy to make and delicious. This looks amazing, wish I could have some now 🙂 Great SRC pick! Looks great! I love using the slow cooker, and this looks like a fantastic way to use it!